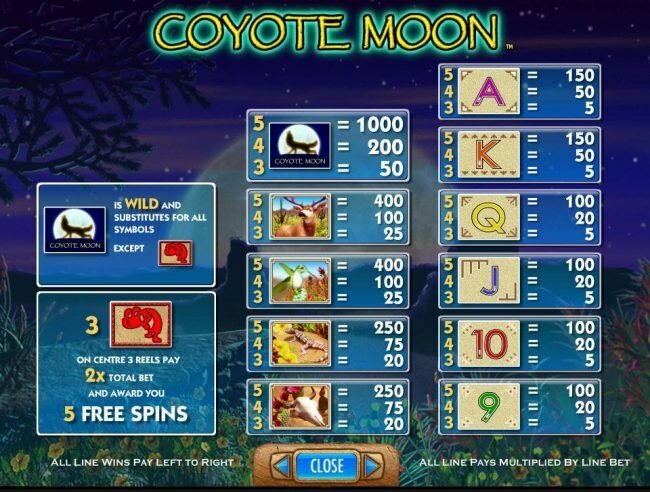 Coyote Moon Slots has not been reviewed yet, be the first to rate this slot. 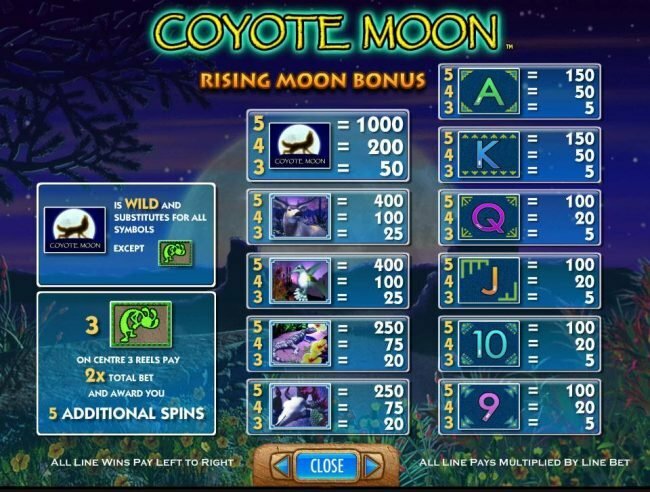 Coyote Moon Slot comes with 5 reels and 40 paylines. This slot was designed by IGT and it has a $50,000 top jackpot, with wilds and Free Spins being its main features. 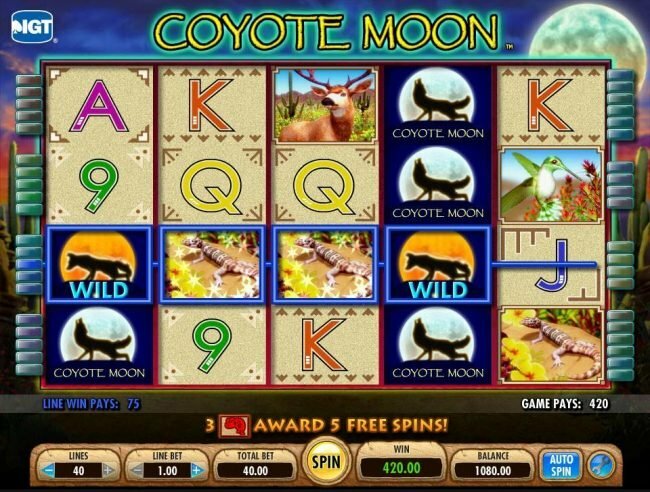 The focus with this slot’s theme is on the desert and on one of its best known inhabitants, the Coyote. The symbols used here have either images of creatures one would expect to find in the desert or they are playing cards with a sand like background. 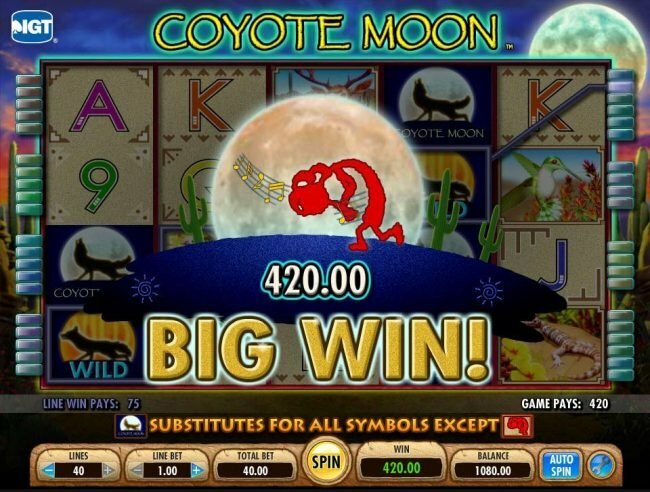 The image in the background of the slot is a desert at night, with the moon easily seen at the top of the reels. As for the images found on the reels, you will notice not only the Coyote Moon symbol as a stacked wild, but also lizards, buffalo skulls, deer and hummingbirds. The game’s playing cards are the ones from 9 to A and they’re low value. Wagers are done on the 40 paylines of the game, with 1 coin for each one. 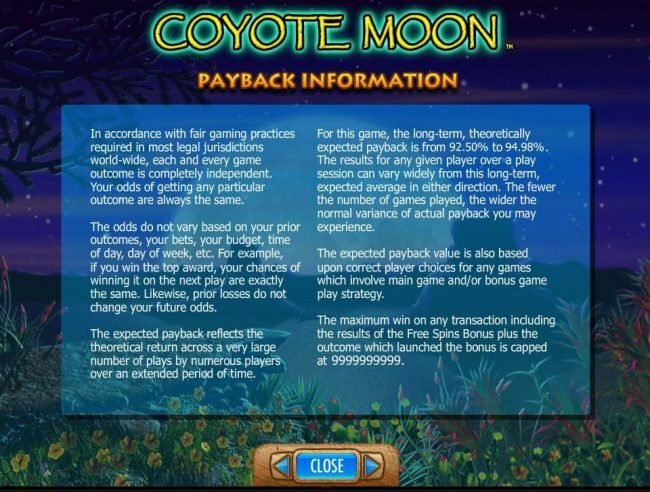 The coin value is quite high in this game, with the smallest value at $1, while the maximum bet per payline is $50. If you use the Max Bet option, the bet is up to $2,000 for one spin. The awards mentioned in the paytable are a multiple of the line bet, so if the $50 maximum bet per payline is used, the top jackpot of 1000 coins will mean a prize of $50,000. The stacked wild, which uses the logo of the game as its image, will substitute for other symbols, and it can be a good way to make some money. They can occupy an entire reel when they appear, so the odds of getting a winning combo are increased considerably. This is also the symbol that awards the top jackpot of 1000x the line bet, but you need a payline with 5 wilds on it, and that’s no easy task. 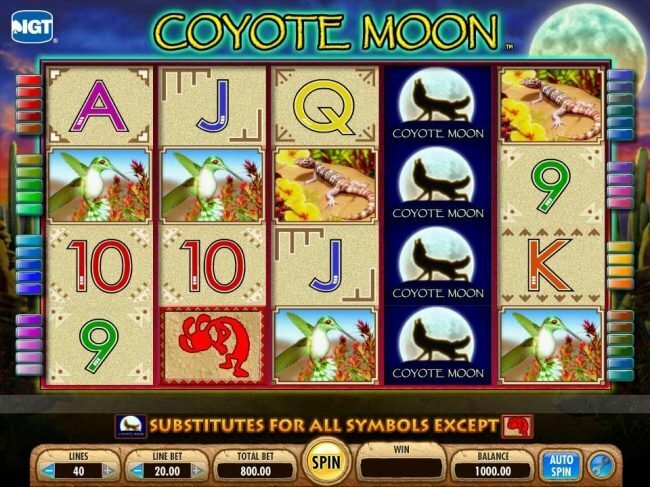 Coyote Moon offers a scatter symbol as well. This symbol shows up on reels 2, 3 and 4. When that happens on all three reels at the same time, there is a prize of 5 spins awarded, with a cash prize which is double the total bet made on that spin. 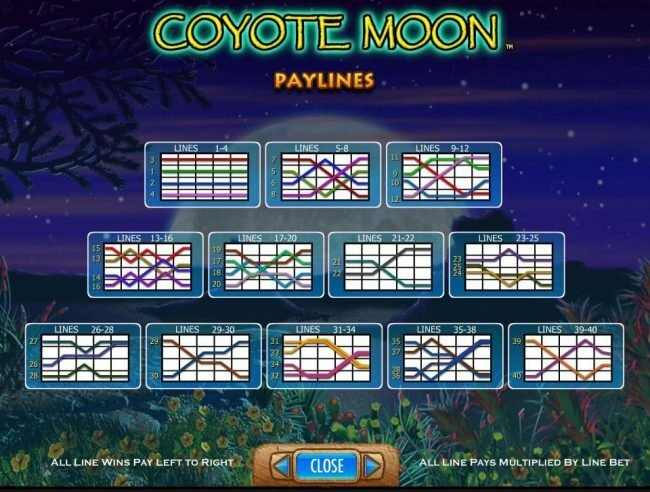 I’m not sure how many people will be attracted by a slot with a theme based on the desert and coyotes, especially since the features exist but they’re nothing special.